They say that it's probably unethical for a fan to interview one of his favorite creators. That may be so. Here at COMICDOM though, we like to bend the rules a little and to test our journalistic limits. Mike Mignola is one the most important mainstream creators of our time and arguably the only one who has managed to create an iconic character with crossover appeal to the world outside of comics, at least since two kids came up with a parody book about four mutant turtles. Vasilis Sakkos is a self-confessed HELLBOY and Mignola fan and was always looking for an opportunity to ask the creator a few questions. There you go, buddy. Don't screw this up. COMICDOM: What memory has lingered on in your mind from your initial efforts in the comic book field? MIKE MIGNOLA: I'll never forget the horrible feeling of having no idea what I was doing in those early years. My first book wasn't so bad (ROCKET RACCOON) but after that, the first real superhero stuff (HULK and ALPHA FLIGHT) was like pulling teeth. I hated getting up in the morning. Things got better eventually but I would never want to go back to doing that kind of stuff again. COMICDOM: How would you describe your collaboration with other writers in the past? Was it a restrictive process? MIGNOLA: I don't remember ever having a problem working with writers. In the early days I had no idea what I wanted to be doing (except I wanted to do more monsters and less superheros), I had no thoughts of writing my own stuff, so we got along fine. When I did finally realize the kind of book I wanted to do, I knew I had to at least plot it myself. John Byrne scripted the first HELLBOY series which was a great help - I couldn't have done that book without him. But at the end of that first story it was clear to everyone that I would have to take on the whole writing job. COMICDOM: Hellboy has become an iconic figure. Many questions arise. First off, how would you respond to people viewing your work as a "Warholic", mechanistic reproduction of the same images in consecutive pages? MIGNOLA: It is certainly easier to work on something when it is largely unknown. The more HELLBOY I do the more I worry that the audience will be disappointed. I don't want to do the same stories over and over again. I don't want to bore the audience, but I also worry that if I do something TOO different the audience will get upset. For ME I need the story and character to change as time goes by. I need the story to be going someplace. COMICDOM: If Hellboy started out like a character to facilitate your passion to dwell into the realms of folklore and mythology, in what ways do you think he has evolved over the years? 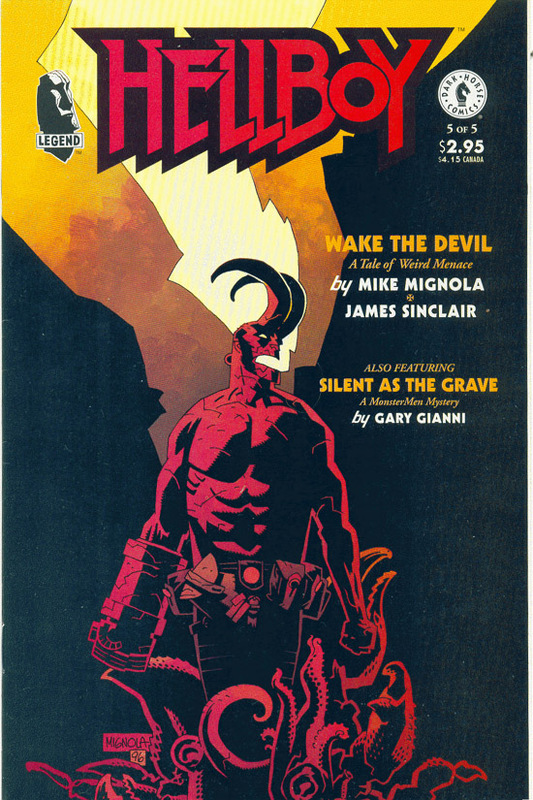 MIGNOLA: The biggest change in Hellboy over the years is that HE has become the focus of the stories. He was originally created as a way to do stories like "The Corpse" and "Heads", stories that have nothing to do with who he is or where he came from. But over the years his story has sort of taken over. COMICDOM: Did Hellboy become so restrictive as a character in your creative endeavours that you felt he had to be "drowned" for a little while in order for you to "breathe"? MIGNOLA: It just so happened that Hellboy ended up at the bottom of the ocean when my life got swolled up by the making of the film. It wasn't planned that way. COMICDOM: Did your close involvemnet with the film cloud your objectivity about the final result? How do you feel about the film now? MIGNOLA: Yes. The thing I am happiest about with the film is that, even though it's quite different from the comic, fans of the comic seem to like it. They except it as a parallel universe, the Del Toro universe (editor's note: Guillermo Del Toro is the director of the film) version of my work. COMICDOM: Does the mood of the film compliment your own sense of pace in the comic book form? 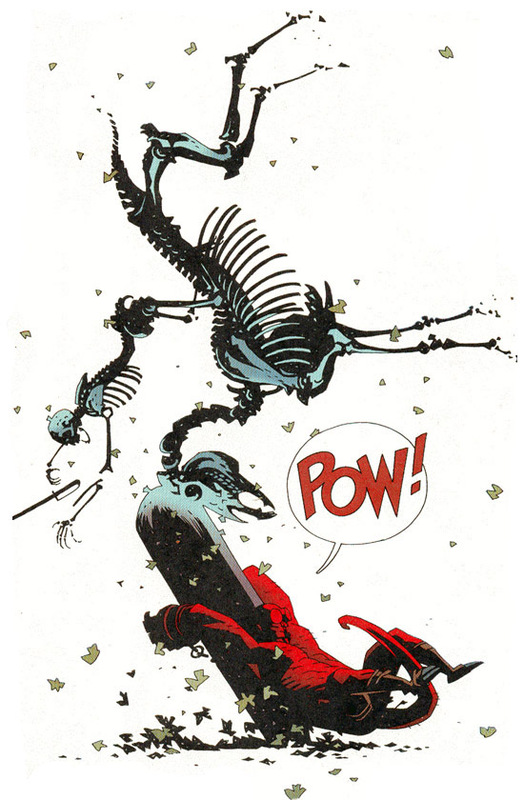 MIGNOLA: The comic and the film are two different animals. From the very beginning I told Del Toro I would rather see the film work as a "Del Toro film" than as just an imitation of the comic. The comic is what it is. Let the film be separate. COMICDOM: Alan Moore recently rid himself of any further involvement of any future film adapatations of his work. Do you feel that in any way the artistic integrity of your work could be compromised through film adaptations? MIGNOLA: I try to view film adaptations (live action or animated) as being completely separate from the comic work I do. Film can be very good for business but they are no the reason I create comics. The ultimate final form for my work is the collected graphic novel. COMICDOM: What is the life of a creation away from its creator? MIGNOLA: From a business point of view it's nice to think that a creation can go on without it's creator but, really, if the creator is removed completely, the creation will change to something else. Sometimes that can work out well. Sometimes the creation dies a slow horrible death. COMICDOM: How do you feel about having HELLBOY published in black & white in the Greek version by Jemma Press? Youve always had excellent coloring in HELLBOY, but I believe that, with the heavy blacks youre using, it would be very interesting to see the work without the burden of coloring. 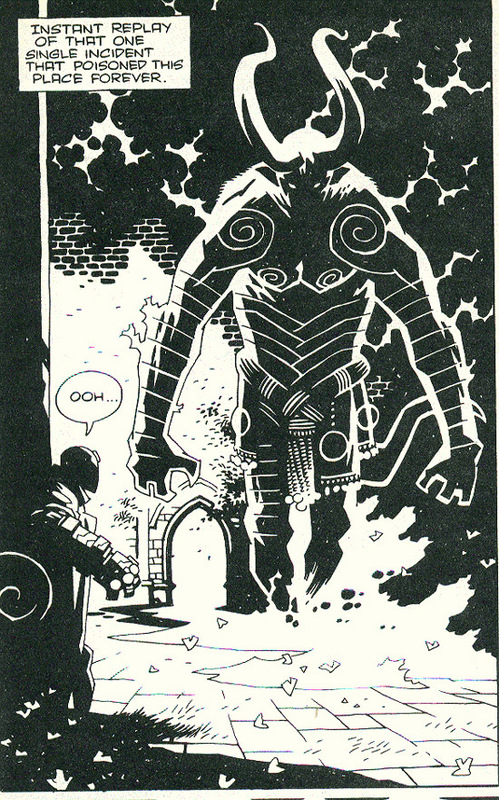 MIGNOLA: I like my work in black and white and I know many people who prefer it that way. That's fine. I do work very closely with my colorist so that the color is always a part of the storytelling. COMICDOM: What is the character you fell most attached to? 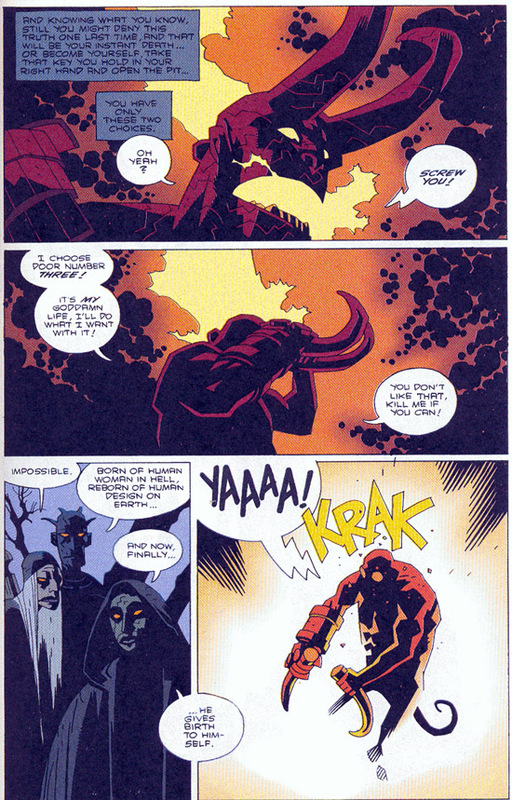 MIGNOLA: Hellboy. He was created to serve all my creative needs and so much of my personality is in him. I cannot imagine ever creating another character like that. COMICDOM: To whom would you like to entrust your creations in the future? MIGNOLA: I'm very happy to have John Arcudi and Guy Davis working with me on the BPRD book and Lee Bermejo drawing the upcoming Hellboy series, DARKNESS CALLS. I am also thrilled to be working with Richard Corben on an upcoming Hellboy project. But I cannot imagine turning things over completely to another writer or artist - I need to keep my ideas in there. COMICDOM: How do you feel when having to turn over your creations to other artists? HELLBOY: WEIRD TALES provided us with amazing stories but how confident were you about it at first? MIGNOLA: WEIRD TALES was different from the projects mentioned above. The idea with those books was to have other creators do THEIR OWN personal takes on my characters. The stories I was most happy with were the ones that were completely different than anything I would do. COMICDOM: Now, Hellboy is a highly commercially profitable character, you are a bankable name, you have your own universe wherein to spin your tales. Where else do you want to venture from here? What are your dreams in the creative field? MIGNOLA: I want to keep the Hellboy "universe" going, writing and co-writing and doing some of the art. At the same time I NEED to carve out time to do more non-Hellboy projects. I'm co-writing a novel with Christopher Golden and will be doing a large number of illustrations for it. I also plan to do more stand-alone comics and graphic novels. I have no plans to create another series character like Hellboy. COMICDOM: Your artistic style and your work give me an eerie drowning sensation, like tar filling my lungs until i find breathing is unrequired in order to enjoy the process. How would you desribe your mood when youre drawing it? MIGNOLA: My mood when I'm drawing... almost constant frustration that I'm not better and faster. COMICDOM: It feels like you are contributing to the myth making traditions you are letting us dwell in. How do you feel about your own tales intertwining with tradition? MIGNOLA: I like to think that with HELLBOY I am taking some old traditional stories and giving them a new coat of paint. I don't think I'm improving on the old stories but hopefully I'm exposing a new audience to them. COMICDOM: Do you want to let your lyrical side run rampant without the interruption of Hellboy or do you think his appearence is as vital as the atmosphere he lightens? MIGNOLA: I think the working stiff mentality of Hellboy is a good and necessary balance to my more "lyrical" side--In this I think you see the two sides of my personality. COMICDOM: Hellboy is ultimately a ray of sunshine in the stories. Where does beauty lie for him and for you? MIGNOLA: Sitting back at the end of a job and feeling that you've done it as well as you can. COMICDOM: As a deeply human character, Hellboy is a tragicomic figure. Will there be any rest for him? 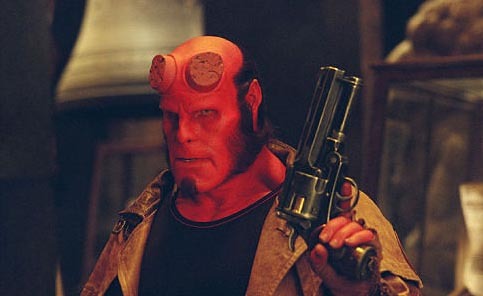 COMICDOM: How many facets of your personality or upbringing have been infused in Hellboy's character? COMICDOM: I think my grandfather will appreciate Hellboy's grittiness, straight froward manner and defiance toward the powers that be, while my grandmother will be delighted with the tales he is a part of. They definitely echo some of her own. Thank you for giving me something to share with them and thank you for your time.